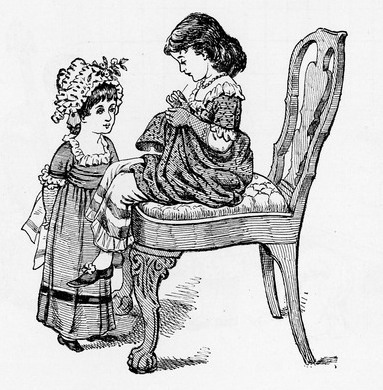 A little girl sits in a large chair sewing a tear in her dress while another little girl watches. This charming, vintage sewing image would make a great addition to your next arts and crafts project. This illustration and a number of others comes from the 1880 children’s book Afternoon Tea. It was written by J.G. Sowerby and published by McLoughlin Bros., Inc.